Q: Does the price that I see include set up and delivery? A: Yes, the price includes setup and delivery although additional travel fees may apply for areas farther out. Remember prices do not include sales tax. Q: Do you deliver your inflatable party rentals to other cities? A: No. We arrive early to set up your inflatable so you get the entire rental time to play. Q: When do you set up your bounce houses and water slides? A: That depends on how many rentals we have going out on that day. Generally we arrive 1-3 hours before the rental time begins. If we have a lot of rentals that day, we may need to set up as early as 4 hours in advance. If this is the case, we will call the Friday before to confirm that someone will be at the party location. And no, you won't be charged for any additional time that you get to jump and slide! A: No. We pride ourselves in providing some of the cleanest and newest looking inflatables in the Sacramento area. 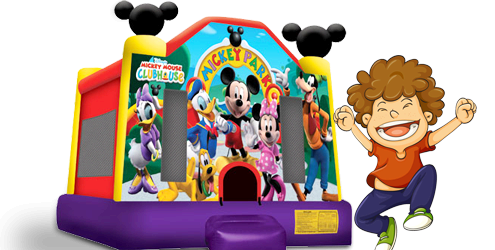 party bounce house rentals cleans and disinfects after every rental and we guarantee that you'll be satisfied..
Q: Do we have to keep our inflatable party rental plugged in the entire time? A: Yes, unless otherwise specified in safety training (kids should be removed from the jump and the blower should be turned off in high winds). A blower keeps air in the jump unit the entire time. Once unplugged they deflate. That´s why we require an outlet within 50´ of the unit or a generator. Longer cords can pop your circuit breaker so we bring our own heavy duty cords. A: Parks are great for many reasons. We love setting up at parks. However, keep in mind that most parks do NOT have electricity. If you want to set up at a park, you must rent a generator. We rent generators at a resonable cost. Also, parks are first come, first serve so get your spot early in the day. A: We accept Cash or Credit Cards. If paying by cash, please have exact change as our drivers do not carry cash. 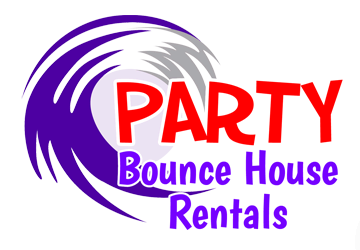 A: Unlike many of our competitors, Party Bounce House Rentals does not require deposits for orders over $70. A: Check the requirements listed with each jump. Also, make sure you have at least a 4´ access to the area where it will be set up. We're strong, but we can't lift these larger inflatables over walls. The jumps can weigh up to 650 pounds so we need a clear path with ample room.